The firmware update to a Sansa Clip allows for a "resume playback" feature when audiobooks are transferred to the "Audiobooks" folder. New Sansa Clips and Sansa Fuzes have an Audiobooks folder. When the audiobook is transferred from the OverDrive Media Console to that special Audiobooks folder (instead of into the Music folder), the resume playback feature will hold your last known locations for that audiobook part. 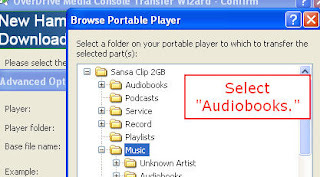 Here are the instructions to add OverDrive audiobooks to the correct folder to enable this feature. Checkout and download a book to your computer like normal. Open OverDrive Media Console, if necessary. Wait a minute to let Windows recognize your player. A dialog box will open showing the name of the audibook. On the dialog box that shows the parts of the audiobook, click on the "Advanced Options..." button. You may be asked if you wish to create a new folder for the title. Click "no." A new "Advanced Options" dialog box loads. From this box, click on "Browse." Choose "Audiobooks" instead of "Music." Create a new folder, if desired, and name it the title of your audiobook. Notice that the path in the Advanced Options dialog box has changed to "Audiobooks/[title of audiobook folder]"
Click "Next" to start the transfer. The book will transfer as normal. You'll be prompted to unplug your player. You'll find the audiobooks under: Music >> Audiobooks >> Title. When you return to a title that you'd previously listened to, you'll see a menu item "Resume Playback." Choose that option to continue with the audiobook.